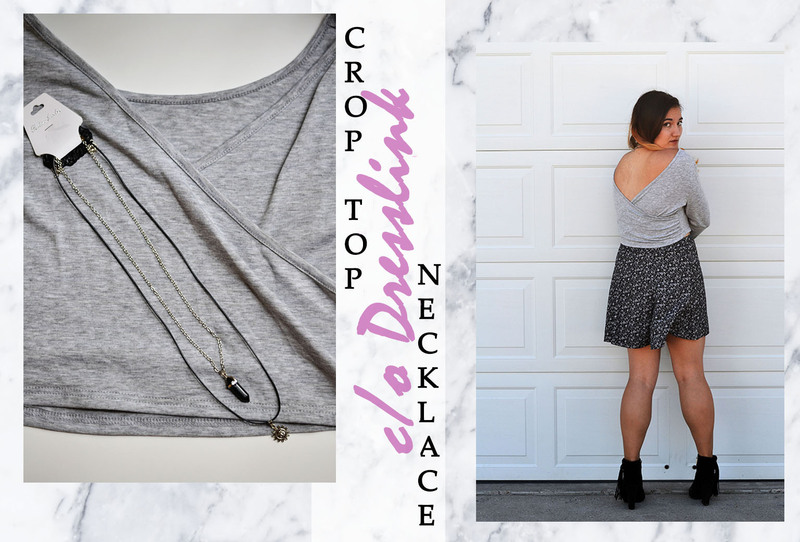 Hello everyone and welcome back to what's actually a legit fashion post! Yay! A few weeks ago, Dresslink got in contact with me again (see previous posts with them HERE and HERE) to see if I'd like to review a few of their items and I said yes. After browsing their site for a bit, I settled on a couple jewelry items and tops. Naturally, the Harry Potter themed bracelet (click HERE to find it) was screaming for me to get it! Featured above is also a bralette (found HERE) with some cool cage-like detailing in the back. 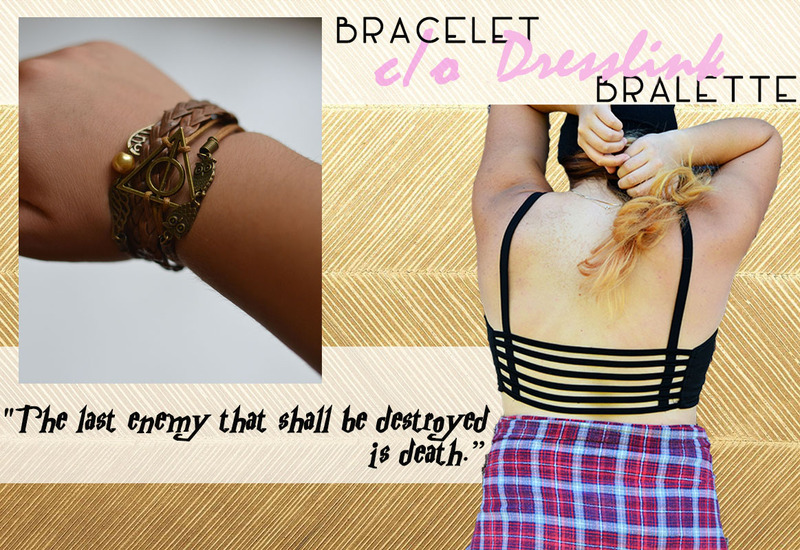 My impression of the bracelet is that while I love the theme (the Deathly Hallows! Little Hedwigs! A golden snitch! ), it's very cheaply made. Already one of the rings started to come apart and I had to use a pair of pliers to keep it together. So, it's still usable, just needed a little mending. The bralette was decent at first, but I noticed after wearing it for a few days that it's already starting to stretch out. Sigh. So I'll probably end up never wearing it unless I'm lounging around at home. The hunt for the perfect bralette continues! Now, these next two items were the winners of the group! 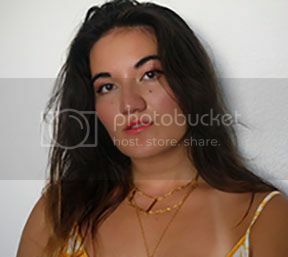 I picked out this choker necklace set (found HERE) along with the long-sleeved crop top (found HERE). Man oh man, am I going to be living in these pieces! The necklace set is holding together just fine, and the choker stretched comfortably to slide over my head and rest on my neck. The other two strands were big enough to slip over my head without a need to unhook the chains. Then there's the crop top. Mmmmm, just look at that devilish little peek of skin in the back. I love when basic looking clothes have a fun detail. The wrap design adds to the appeal, and I know I'll be wearing this a ton in the upcoming months! I'm already dreaming up outfits involving high-waisted jeans, tights and shorts, and all the layering possibilities! Hope you guys enjoyed today's post! I also decided to get a little creative and implement some graphic design into this post. What do you think? If you want to see more of these outfits in action and a couple others, be sure to check out my Youtube video HERE! I did an "Edgy Everyday Lookbook" set to another Rival Sons tune (no better rock group to listen to right now). the grey top is truly beautiful! very cool looks! your style is super cool! Whoa, Linda! I've missed so much--I'm always impressed by your abiliy to produce quality content so often. Your roadtrip part two is simply stunning--the sunset and sunrise beach photos really evoke a calm and carefree vibe. I feel more balanced looking at them. Keep working that new lens! (Are we camera twins now? Are you using the 50mm with your D3100?) I also checked roadtrippers out, and it looks like a valuable tool. I'll be sure to use it if I embark on a spontaneous expedition! Your life lately posts are my favorite--they bring so much depth to any blog, in my opinion. You've seen, tackled, and accomplished so much this summer. I'm so proud of your graphic design work--so eyecatching, clean, and colorful. As for Nick Jonas' video, I whole-heartedly agree. You're not bitching at all--you're promoting a healthier, and frankly, more right attitude towards women. Way to stand up for yourself and for all of us! As for this set, your unique edge shines through. I read Harry Potter for the first time this summer and loved the story, so I dig that bracelet. Your ensembles scream bold and confident! Wishing you a smooth transition back. Praying this year is wonderful and fulfilling! GIRL YAAAS! 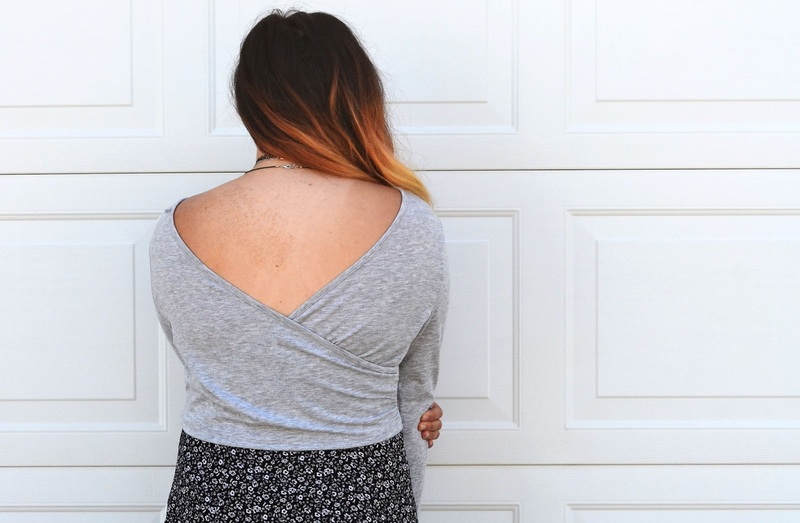 I love this top on you so much, and that back is just darling. 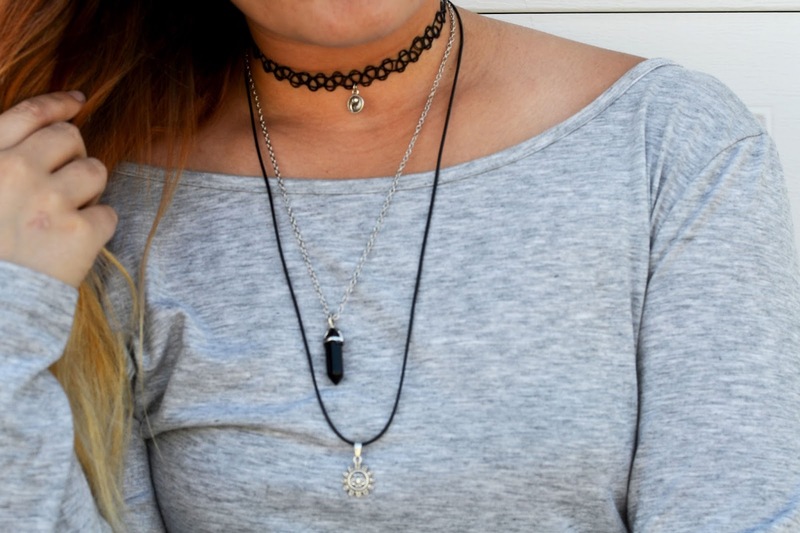 Choker necklaces are the best, aren't they? Way to channel that middle school angst but in a perfectly cute way! Also. Yes to the Harry Potter!! Hahahaha, I just adore you for freaking out over that. Sorry it's so cheaply made--that's just how it goes with so many overseas companies with low priced items. I hope it lasts you long enough to get some wear out of it. PEOPLE GOTTA KNOW YOU LOVE HARRY POTTER! And you made my day by saying Northern Lights has become basically a TV series. I LOVE THAT! He's such a character. Now I know his real name, but I told him I called him Northern Lights and he just thought it was the best thing. I've actually got a 30 mile ride with him and another local dad in the morning so... I've best be off. KEEP ON BEING CUTE AND TRENDY, LINDA!!! I love that grey top and those necklaces. Sorry to hear about the quality of the other jewelry.